For eight weeks, two groups of students in Los Angeles and Montreal worked together to help a tiny plush robot named Laika reach her spaceship as part of Robot Heart Stories. A team of photographers documented the robot’s journey, fueled by the students’ creative output. Lance Weiler’s most recent project began with a simple yet provocative question: can a robot reboot education? To answer that question, Weiler collaborated with fellow Workbook Project contributor Janine Saunders in creating Robot Heart Stories with a team of more than 50 creative professionals. The initial observations of the students were typical. An early letter from the LA class reads: “One thing is we eat food like tacos, pasta, bread, soup, and steak. Do you consume oil? We don’t drink oil over here! 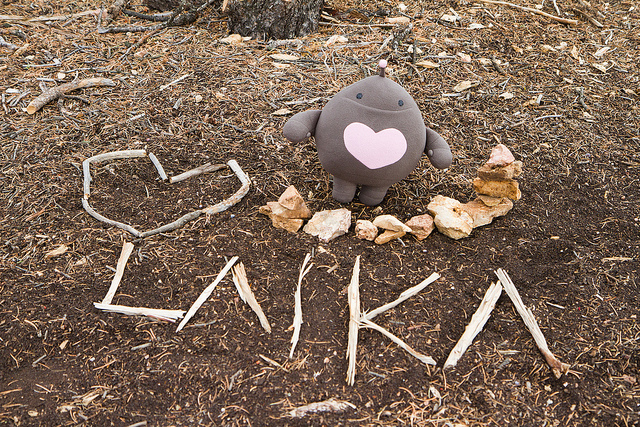 What do you like to do for fun?” Things quickly evolved as project photographers drove Laika from Canada to the U.S. The students started taking ownership of the project. Shortly after naming the robot Laika, they started integrating their studies into the project. The Los Angeles students gave Laika advice about sustainable energy, while the Montreal group made a series of videos, beginning with Laika’s Song, a Monty Python inspired animation. Their content pushed by the structure created by the producers soon incorporated mythological, whimsical and spiritual elements.